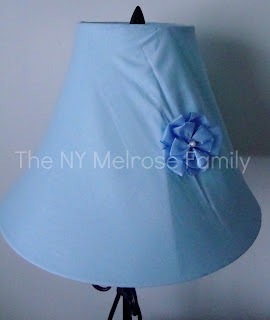 I’m not quite sure what inspired me to want to redo the lamp shade in our bedroom and turn it into a no sew lamp shade. It very well could have been that I just got sick of seeing the hole through the shade. Every time I turned the hole to face the wall it always seemed to get turned around back towards the front as if it was taunting me. I recently spruced up our master bedroom, which you can read all about here. Consequently, this horrid shade stuck out like a sore thumb. Before I give the tutorial on how I went about making over this beaut. I feel it’s important to remind you that I don’t sew. I know, gasp! So when I walked into JoAnn Fabrics looking for a material for the shade I was totally overwhelmed. I walked in circles for a good twenty minutes and when I went to the counter to have it cut. I told her “I need to eyeball it.” Yes my friends, that is the technical jargon for I have no freakin’ idea lady. Luckily, she obliged my request and let me see how big a yard was. I went with a yard. I started out by cutting open a brown paper grocery store bag. I cut it open like I did when I was in elementary school and needed to cover my textbooks. 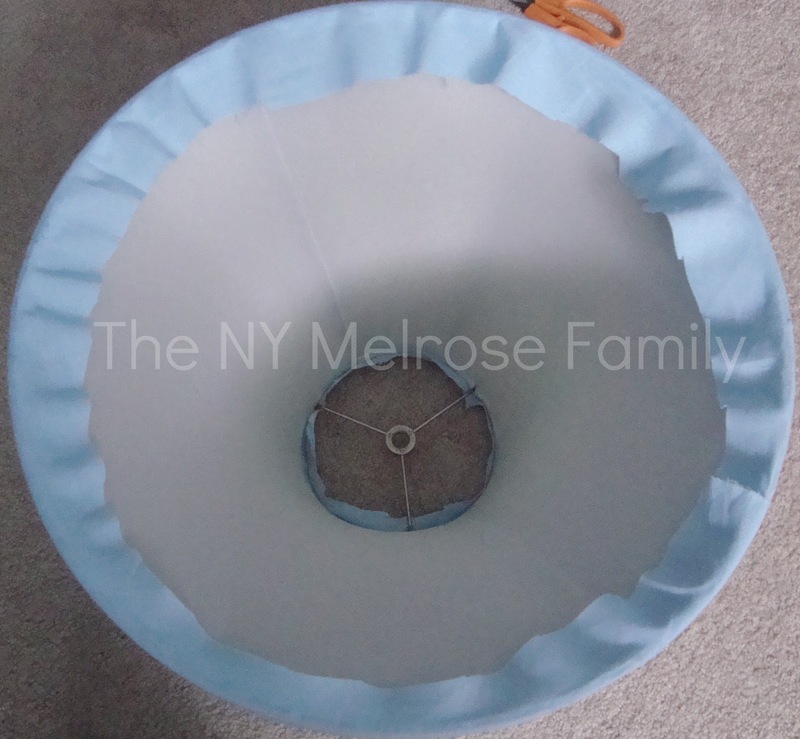 I then placed the lamp on it’s side and traced the bottom frame of the shade on the bag as I rolled it from one seam to the other seam. I did the same thing with the top of the shade. You need to make sure that you have the shade back to where it was when you traced the bottom frame. The paper bag was not tall enough to trace from one seam and back to it. 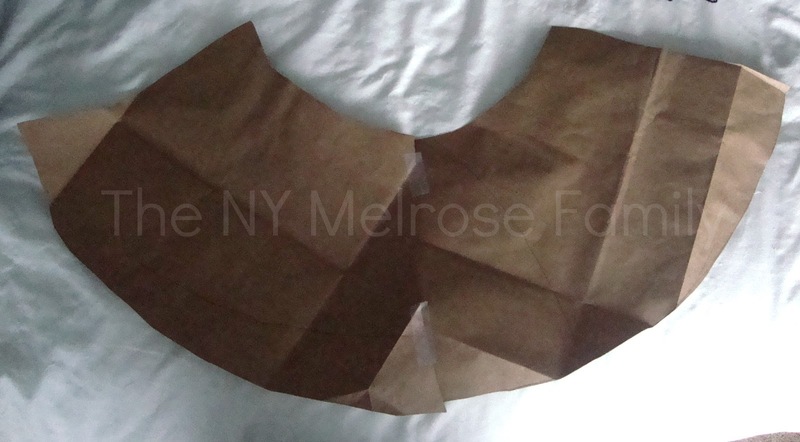 So I simply traced half of the shade and then duplicated that half on another piece of the bag. As you can see from the picture I then taped the two halves together. Once you have your model shade, you’ll want to wrap it around the shade to make sure it fits. When you trace out your shade onto your fabric you want to leave 2 inches above and below your model. Then simply cut out your stencil on the fabric. Wrap the fabric tight around the shade to make sure it fits. Using fabric glue, glue down a straight edge for the seam. Next, place a thin line of fabric glue along the top of the frame to glue the fabric down. 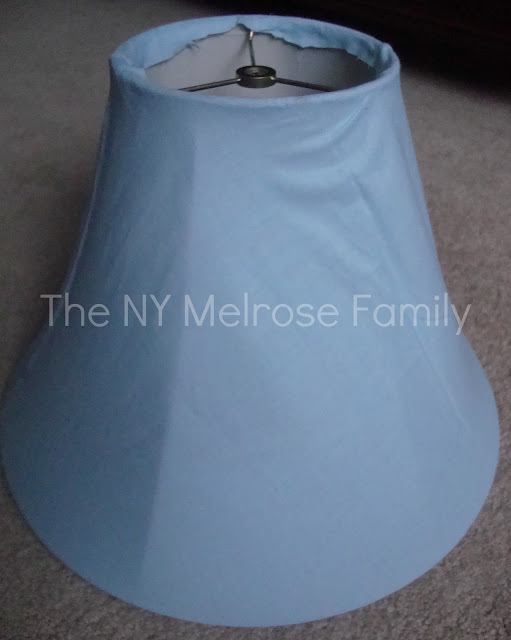 Finally, place the fabric glue along the bottom edge of the lamp shade. You will have fabric folded over the top and the bottom. I trimmed down the amount that I had and glued down the overhang. 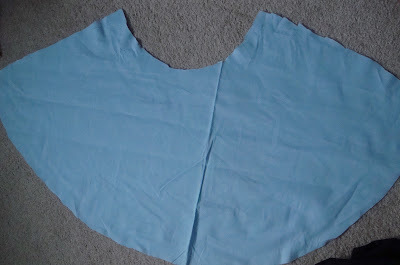 To complete the shade, you’ll need to fold the edge over so that you have a straight edge for your seam. Use the fabric glue to glue this straight edge on top of the original seam. This picture was before I glued down the overhang. To the finished lamp shade I added my own flower. I hot glued the flower together and used fabric glue to attach it to the shade. Here’s a picture of it lit up. LOVE! Two important things that I learned from this project is to make sure you iron your fabric before you cut it out. I clearly forgot to do this, but tried my best to make it part of the texture of the shade. Also, try to keep the fabric tight. The shape of the shade will largely effect the ease at which you are able to accomplish this. Good luck! I love it. When Z saw it, she said, “mommy can you buy me that lamp?” I take that to mean when we get our big girl room I'll have to make one. Thanks for sharing! Ok for someone that 'doesn't sew' you did an amazing job. You even made a pattern. I am impressed. There is no stopping you now :). You did a beautiful job! Jenny, that's as cute as can be! girl, that is awesome!!! It does match perfectly and is pretty! me=impressed! Looks great with the pillow shams. Great job! 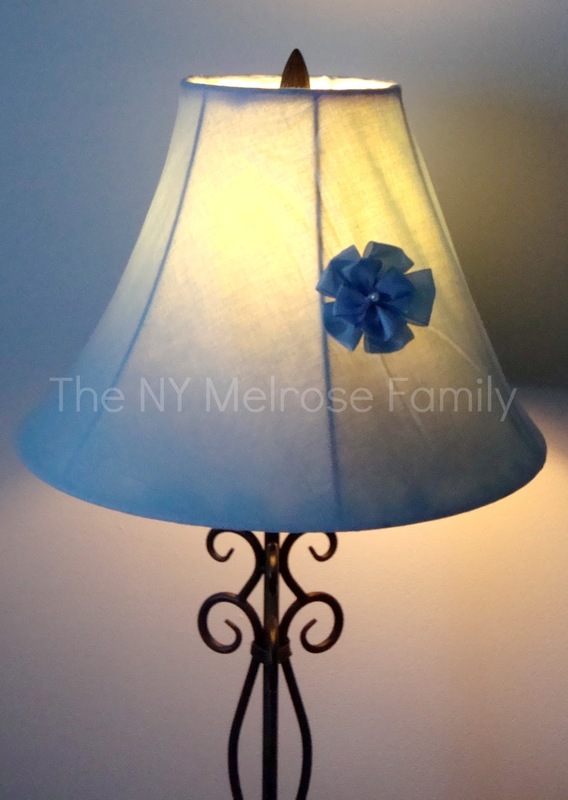 The lampshade turned out beautifully! I did this with wrapping paper once! But I'm loving this blue! That turned out great! 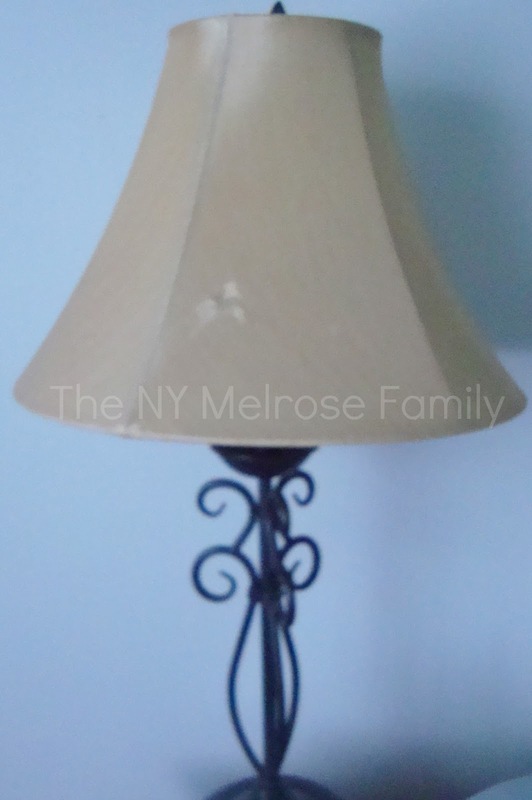 I love the humor in your post too 🙂 I have two lampshades like yours to re-do. Thanks for the inspiration! Cute! Cute! Cute! And – the blog is looking great! Would love to have you post at my linky party… Hope all is well.. The lamp turned out wonderfully. It goes so well with the room now. Thanks for sharing at Terrific Tuesdays. Perfect timing. I need to do this exact thing and had no idea how to get started. I love the eyeballing the material, lol. Thanks for sharing at our party this week. 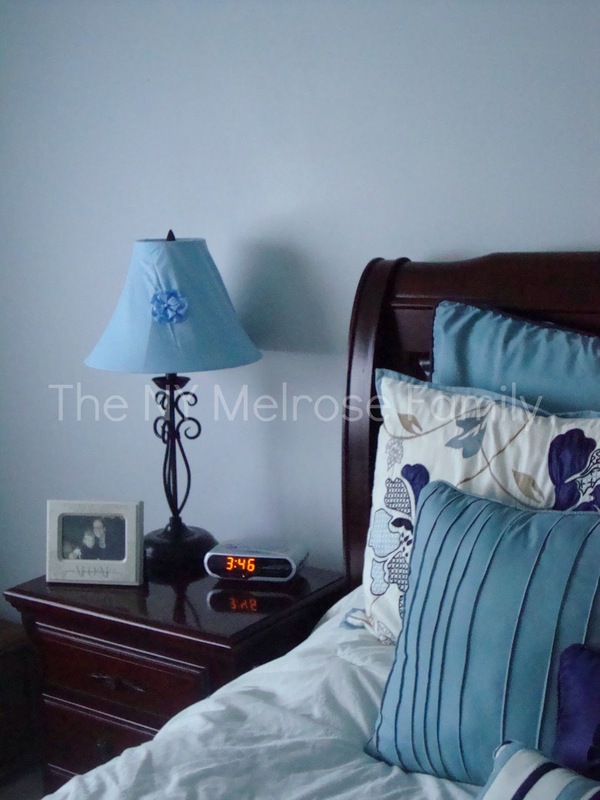 It looks so pretty and brings a feeling of tranquility to the room in that last pic! I love when folks repurpose what's on hand instead of putting it in the landfill. Kudos to you for braving JoAnns …the outcome was so worth it. I love this redo. And I always forget to iron first too, don't feel alone in that. Thanks for sharing on Tout It Tuesday! This redo looks so cute! I love that its easy. I also don't sew and like that I can do this. Thanks for sharing at Showcase Your Talent Thursday! I like the little flower on the shade! Needed to draft you that very small note in order to say thanks once again for the fantastic strategies you have shown on this site. This has been extremely open-handed with people like you to deliver unhampered precisely what many of us might have supplied as an e book in making some bucks for themselves, primarily seeing that you might have tried it if you considered necessary. Those good ideas as well served like the fantastic way to realize that someone else have a similar dream the same as my very own to grasp good deal more in regard to this condition. I am sure there are numerous more pleasurable situations up front for people who check out your blog. I just want to tell you that I’m very new to blogs and honestly enjoyed your blog site. Probably I’m planning to bookmark your site . You definitely come with good stories. With thanks for sharing with us your webpage.